SUE ENDLE of Woodbury, MN Wins TOP HONORS as Franchise of the Year! 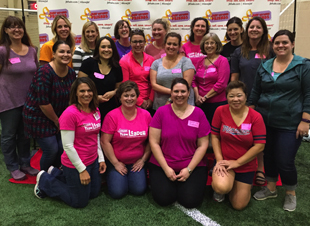 JBF Woodbury helps families save and make money at big kids consignment event twice a year. Woodbury, MN. – A small business from Woodbury is receiving national recognition as Franchise of the Year for Just Between Friends Franchise System, Inc. (JBF). 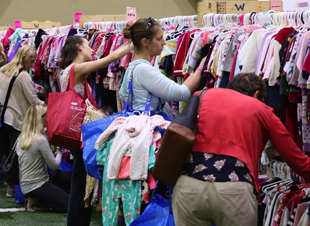 JBF is North America’s leading children’s and maternity consignment sales event. Sue Endle has owned and operated the popular kids’ consignment event in Woodbury for two and a half years after purchasing it from the previous owners. And in that time, the franchise has experienced tremendous growth. Twice a year, Endle hosts a community event where thousands of local families can save money and earn money on items for their children. 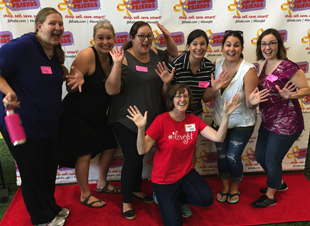 At JBF events, local families sign up as consignors and sell the new and gently used children’s items their families have outgrown or never used. They can earn between 60% and 70% of the selling price. This helps families declutter their homes and turn that “clutter into cash.” Families also have an opportunity to shop the JBF events where they can typically save 50% to 90% off retail on items they need for their children: clothing, shoes, toys, baby equipment, furniture, games and much more. The independent judges who chose Sue Endle and her Woodbury event as the winning franchise said one key deciding factor is that Endle has the ‘strongest economic model’ compared with the other franchisee candidates. Since purchasing the franchise in 2016, Endle has increased sales at her event in Woodbury by more than 200 percent. “I am thrilled the judges chose Sue Endle and even more excited about this tremendous growth. Not only is this great news for her business, it also means she and JBF are helping even more families save and make money. That is the heart of Just Between Friends,” said Shannon Wilburn, CEO and Co-Founder of Just Between Friends Franchise Systems, Inc. Judges said a key component of Endle’s success in Woodbury is how she mastered JBF operations through hard work and tenacity. At the same time, she focused on community building and it paid off. One area where she created impressive growth was social media. In two years, Endle tripled the number of Facebook fans as well as tripling her email list. She also utilized various Facebook promotions and text messaging to promote her event and to help her consignors and shoppers. The judges noted her creativity and her ‘use of characters, photo props and the overall scale of the sale’, adding that it was above and beyond what they saw from other applicants. One of the judges favorite marketing tactics was Endle’s use of a drone to capture creative images of her event. It helped to visually show what a big event JBF is in Woodbury. “I am honored that the judges chose my franchise for this award. When my family and I purchased this franchise from the previous owners in 2016, it was a tremendous leap of faith. We truly wanted to create a community event that was a win-win-win for all involved. And I believe our success can be attributed to following the core mission of JBF ‘to glorify God by bringing communities together in a welcoming, friendly venue. I am excited to see what 2019 will bring and to be able to help more families in Woodbury,” added Sue Endle, owner and event coordinator for Just Between Friends of Woodbury. JBF-Woodbury is planning its spring event March 8- 11 at the Health East Sports Center in Woodbury. For more information or to schedule an interview with Sue Endle or with JBF CEO and Co- Shannon Wilburn, contact Diane White at 918-770-3905 or DianeWhite@jbfsale.com We can also provide photos and video. Sue serves with her amazing team in the Woodbury region of MN. Sue says, "I couldn't do what I do without the help of so many amazing people! They inspire me every single sale!" Interested in bringing a sale to your area?